On our full mission bridge simulator you are able to quickly adapt to the simulated reality and prepare yourself for the worst while hoping for the best. With real equipment on the bridge, a powerful visualization system, a state of the art simulation software and our own Crisis Interface developed by us will create a training experience that you will most probably never forget. Our full mission bridge simulator is as close as you will get without going onboard a real ship. You are able to do training in a real like environment; the instrumentation on our full mission bridge simulator is the same that you will find onboard a ship. All our sailing areas are made to a high level of detail. We have all major sailing areas and ports in the world available from a database consisting of 290 areas and counting. 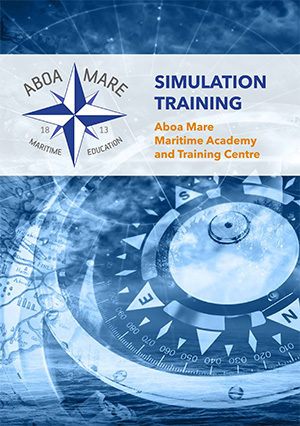 At Aboa Mare we are proud to have our own in-house modelling department that are developing sailing areas for general purposes and for specific high accuracy needs. The ship models we use in our full mission bridge simulator is top of the line quality and highly realistic in their behavior due to 6 degrees of freedom motion capabilities. We have a total of 320 ship models available for use in our full mission bridge simulator. You will experience all environmental effects as you would do for real, but please note that when you open the door and leave the full mission bridge simulator for debriefing or coffee break you will not feel the wind in your face. Nevertheless, during your time in our full mission bridge simulator you are going to notice variable drift due to wind and current, squat, bank and interaction effects, perhaps grounding, various amounts of fog, rain, snow and ice. You can also order your own ship model from us, tailor made to match your actual vessel. All models that we develop are tested and evaluated according to an extensive program to meet our high quality standards in our full mission bridge simulator.